Last night I watched the documentary Grizzly Man. 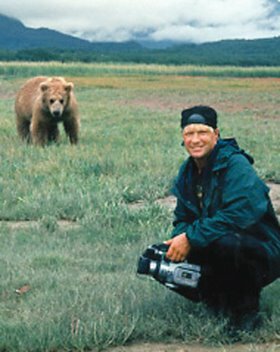 This film was made using video footage of grizzly bears in Alaska, as filmed by Timothy Treadwell, who was eaten by said bears in 2003. You may remember the news stories. Treadwell lived among the bears for 13 consecutive summers--loving them, naming them, approaching them, speaking to them, and frequently declaring his willingness to die for them. He indeed died for them, or at least for one of them, as did his girlfriend (who it turns out was not so keen on the idea in the first place). Fortunately, he left the video footage. On film, Timothy spoke much about his beliefs. At one point, he said he believes God would be very pleased with him for living among the bears unarmed, for desiring only their welfare. Another time, he cursed God. After praying for but not receiving rain, he cursed Jesus, Allah, and any other god that will listen (he called the unknown god the "Hindu Floaty Thing"). He let profanity fly upward. Then, when rain came, he rejoiced in the "miracle" and felt his prayer was heard. It should not surprise us, based on the Bible's description of humanity, that someone would approach God with alternating fits of self righteousness and hostility. The film leads us ponder this reality. The film is also intriguing because Treadwell clearly wanted to escape from the "civilized" society he despised, in order to forge his own space in the wild. In doing so, however, he brought his bitterness, his blasphemy, and his own inner demons into the bears' domain. I wonder what they thought about that. "I wonder what they thought about that." ..but the animals now fear us. Those who hold up animals to be equal or above mankind miss the first point. This guy seems to have missed the second too. It's amazing (or not) how people create this image of what God is. They'll believe in God but never check to find out his true nature. Modern idolatry. And so, like Isaiah says, God won't hear his prayer (59:2). And certainly not the one where he treats Him like a Genie. What a MaMaLuke this guy IS! Where is his Mother to give him a good BEAT-EN and to stay away from the monkeys! People like this are everywhere trying to rule and make Law in Our Land! Yet were Timothy's follies much different from our own? Don't we all try to please God by our good works? Don't we all get frustrated when God doesn't do what we want, and our plans seem to fail because he won't cooperate? Don't we all find ways to escape the world in which we live? Don't we all try to find corners of the world (whether literally or figuratively) where we can do things our way?